Bible Cartoons: Luke 19 - Zacchaeus the tax collector - Scene 04a - Who, me?! 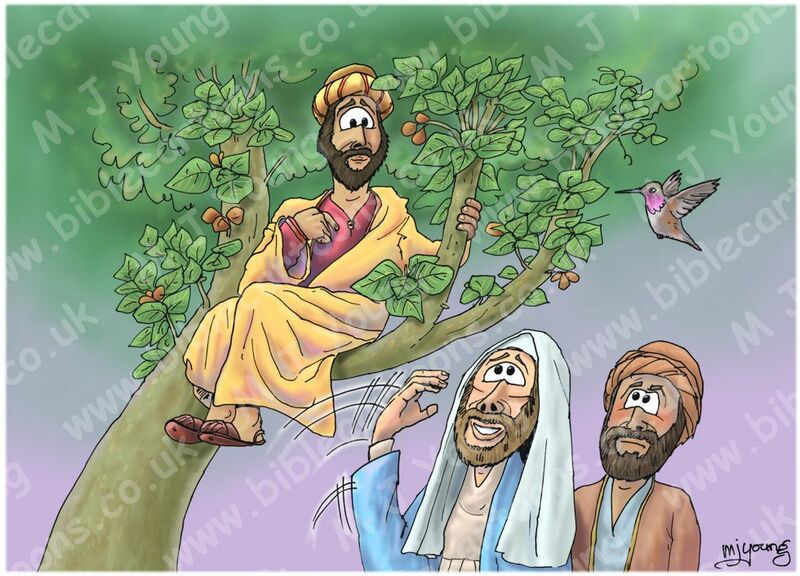 Bible Cartoon: Luke 19 - Zacchaeus the tax collector - Scene 04a - Who, me?! From left to right: Zacchaeus (up the tree), Jesus the Christ gesturing for him to come down, an un-named Hebrew man. This scene has just been finished (Nov 2015) as 1 of 4 pictures for a local school. I was commissioned to produce 4 canvases that show the school values: Excellence, Respect, Inclusion & Aspiration. 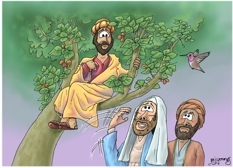 This scene depicts Inclusion, based on the story Jesus’ meeting with Zacchaeus in Luke chapter 19. I decided to include a broad-tailed hummingbird (Selasphorus platycercus) for no particular reason! It is a medium-sized hummingbird, nearly 4 in (10 cm) in length & one of 7 species in the genus Selasphorus.